Sunday, July 25 beginning at 12 noon. "I don’t want to label what other people are doing, but you could say what I’m doing in TFS is a poetry of doubt— its insights, pleasures, and dangers. The disassembling impulse you mention is just that: the attempt to move inward (or outward I suppose) and find some rung to grasp on to. What are the things that are fundamental, constitutive, in the world and in our own personal mythology? So, as you can see, this is a very first-book probing of identity. "It seems, though, that one of the ideas we’ve inherited from the 20th century’s focus on destroying meta-narratives (God, morality, truth, etc.) is that anything is possible: I mean, that one can do anything they want, or be anything they want, that everything is bendable and flexible and, truly, anything goes. There are entire industries (self-help, cosmetics, some branches of medical science) that are devoted to selling the idea that you can have it exactly the way you want it, whenever you want it. This is the engine of modern consumerism, and, I feel, some part of me was cast in this fire. I suppose that’s what makes this personal. "The book, then, is in many ways also a reaction to this idea, as I’ve self-defined it. I suppose what I see myself struggling against is a more general co-opting of language (in politics, marketing, news, etc.) for the purposes of making things easy. I want to make things difficult again. But I want there to be a rung." 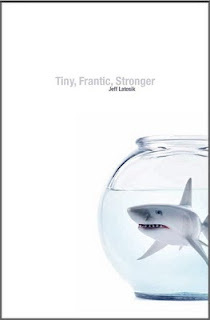 For more information about Jeff Latosik's collection of poems Tiny, Frantic, Stronger, click here. Please help This Ain't the Rosedale Library! As promised, here is the go-to information for how to donate to the grassroots cause of saving This Ain’t the Rosedale library and, if not quite doing that, at least recognizing that what Charlie and Jesse have been doing for the last thirty years amounts to a form of public service. If we can’t save the store, we should at least let our thanks be known to the owners. Donations of any and all sizes will be appreciated. I gave them a hundred bucks, which is an amount of money I routinely pay my bartender for what amounts to a hangover and a lingering sense of guilt. I won’t miss it as much as a bookstore. If you have more, you should consider giving more. Or less, whatever you can reasonably spare. -- Jesse and Charlie Huisken.